Tricky Fox, our Etsy shop this week, comes to us from Kandes in Arizona. 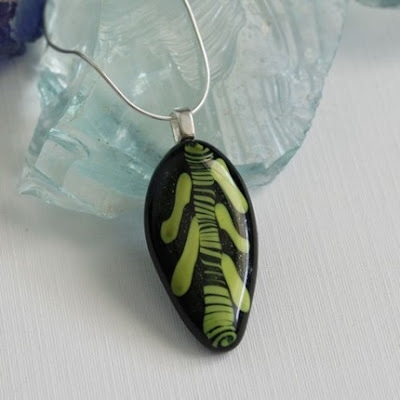 She specializes in wood pendants, fused glass, soldered charms and lampwork glass. 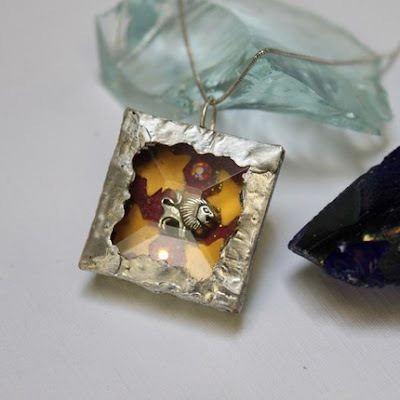 All items are one of a kind and at Tricky Fox you can also get soldered photo charms custom made! Perfect for a birthday gift for that special Leo in your life, this charm is made of sterling silver and Swarovski crystals. 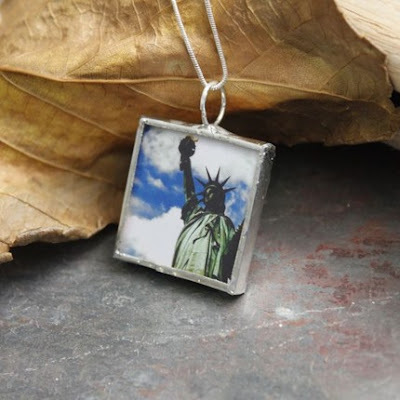 The beautiful lady liberty is turned into a charm that any patriotic American would love. This piece is made of premium paper, sterling silver and Swarovski crystals. By combining green and black glass Kandes created this stunning pendant which hangs from a sterling silver chain. 1. Check out Tricky Fox on Etsy. Come back here and tell us about your favorite item! For this week I am extending the entry deadline until next Monday at midnight so you have a few extra days! Check back Tuesday to see if you are the winner! lovely to see TrickyFox/Kandes work featured here! As a survivor, Tricky's Hope Awareness Ribbon is my favorite. Lovely to see TrickyFox here. Her work is amazing! Kandes does absolutely beautiful work! I can't even begin to pick a favorite - I love them all! The butterfly charms are definitely eye-catching! Thanks for introducing us to yet another interesting shop. You really do give these people some great PR! All the pendants in the shop are very unique. I like the Rainbow Peace Pendant, it's so colorful and really funky. Thanks for the lovely giveaway. Hugs to sweet sweet Barkley! I love the Rainbow and Pink on Glass Soldered Pendant necklace, it is so colorful and unusual and fun looking.